This October’s been a busy month for me. 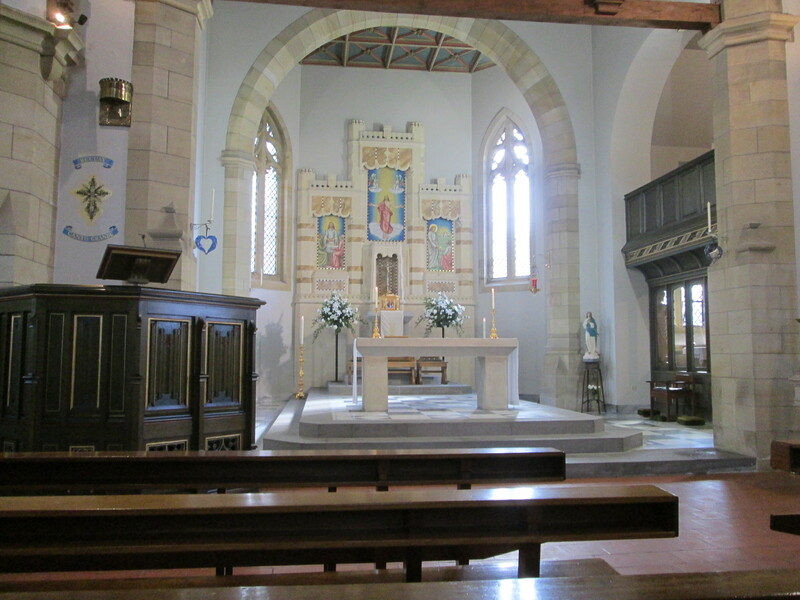 The first item on the agenda was my niece’s wedding in Troon, on the west coast of Scotland. As everyone knows, Scottish weather can be a bit hit or miss, but the day of the wedding dawned sunny and bright, if a little chilly, and we had a fantastic day in beautiful surroundings by the sea. The bride was gorgeous, the church was beautifully decorated, and even the dog was looking festive. This is Eva, who was found by my nephew in the woods, many years ago now, and after a brief stay in the local dog home found her way back into the family. After the wedding, my Legend Press friend and colleague Bea Davenport and I started on a wee tour of libraries and bookshops to promote our books. 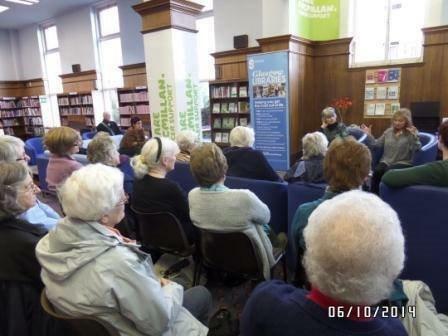 Here we are in Langside Library in Glasgow. Our talk was accompanied by Swiss chocolate hearts and British chocolate pigs (to go with Bea’s new book This Little Piggy), and followed by tea and biscuits so it was a culinary as well as a literary occasion, and a good time was had by all. The Edinburgh Bookshop provided us not only with a ladder to sign, but also with a display of the best Scottish downpour I’ve seen for a very long time. ‘Stoating off the pavement’ didn’t come into it, but fortunately a few intrepid souls braved the elements to attend the event, which again was accompanied by tea and chocolate. 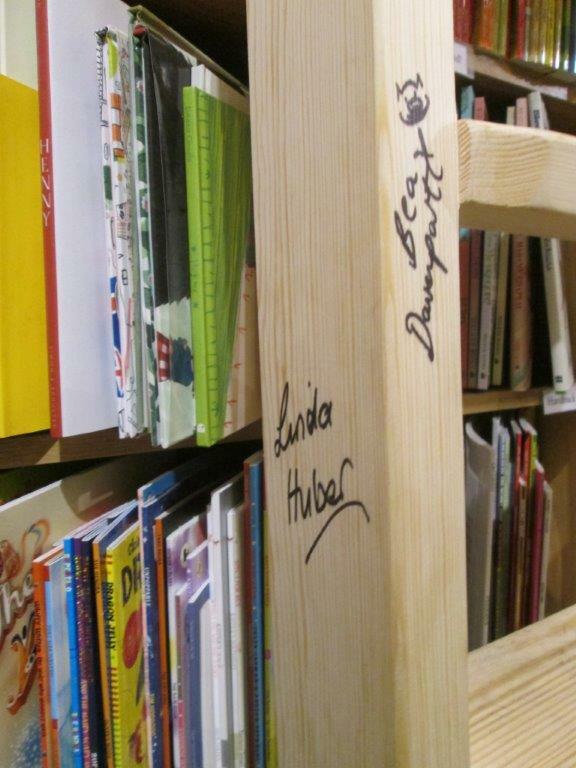 The ladder is a relatively new addition to the shop, which has floor to ceiling shelves. They’re asking all visiting writers to sign it, so if you live in Edinburgh do pop by for a look – they have a few more famous names too! 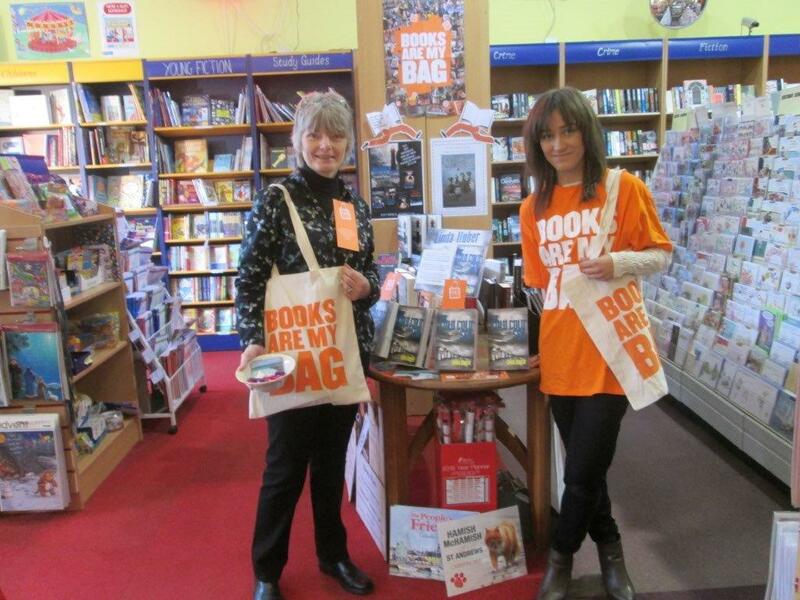 The last event on my list was a visit to The Milngavie Bookshop in Glasgow for ‘Books Are My Bag’ day on October 11th. This was the second ever BAMB, and the aim was to have a writer in every independent bookshop across the UK. 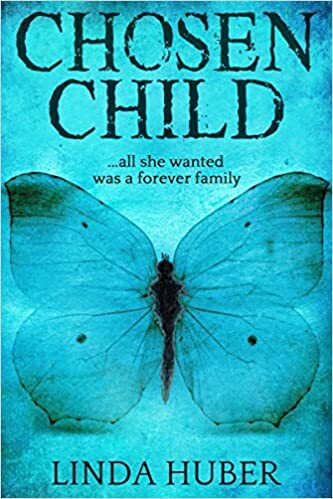 I spent a very happy four hours there – as well as a terrific selection of books they have a wee cafe up the back, and the homemade soup – and the cakes – are amazing. And of course we had the usual Swiss choc… Here I am with The Cold Cold Sea, and one of the assistants wearing the famous BAMB T-shirt! Home again, I discovered that my younger son had made a tiny mistake when he’d parked the car five days beforehand. Leaving the interior light on does the battery no good at all… Wasn’t quite what I’d planned for my first morning back, but never mind! 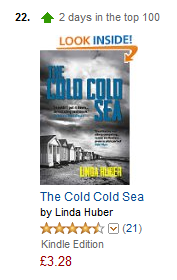 … and number 22 in the all Kindle rankings. So it was a brilliant ending to a hectic three weeks… I’ll be glad to go back to work for a rest now! If you’d like to see more photos of our ‘tour’, have a look on Bea’s blog, October 5th-9th! 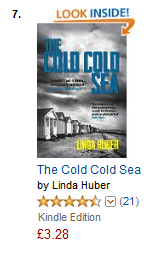 This entry was posted in Scotland, The Writing Life and tagged Books Are My Bag, Legend Press, The Cold Cold Sea, This Little Piggy. Bookmark the permalink.